Scaling questions are simple and accessible tools that have emerged from the solution focused approach to change management. A solution focused approach can be applied to behavioural and academic targets. Focusing on what a student is doing well rather than what is going wrong can build success. The NBSS supports schools in developing solution focused approaches and using solution focused strategies for positive behaviour improvement. The NBSS applies a solution focused approach to its work. Solution focused thinking in education can be applied to all aspects of school life - from promoting and reinforcing positive behaviour, addressing bullying issues, to the running of effective meetings. By focusing on the positive resources and skills inherent in all schools a solution focused approach can enhance the educational and workplace experience for all members of the school community. Once you know what works, do more of it. 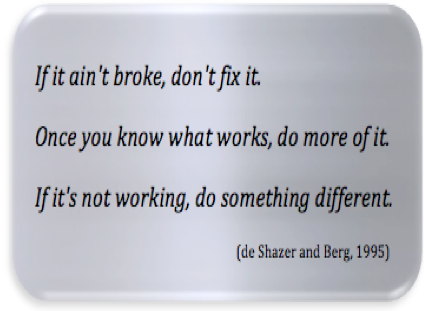 If it's not working, do something different. Solution focused thinking or a solution focused approach holds that as problems do not happen all of the time, a positive way of working is to discover what is working well and then to do more of it. Rather than dwelling on deficits or the history of the problem, a solution focused approach looks to the strengths and resources a person, team or organisation possess and how these can be applied and used to construct potential solutions. From this perspective the focus naturally shifts away from problems and gravitates towards useful solutions. As an adaptable approach solution focused principles are now applied across a range of contexts, for example health, education, community and social care sectors as well as the business and corporate sectors. Building on success – strategies to help people focus on what they’re doing well rather than what’s going wrong. 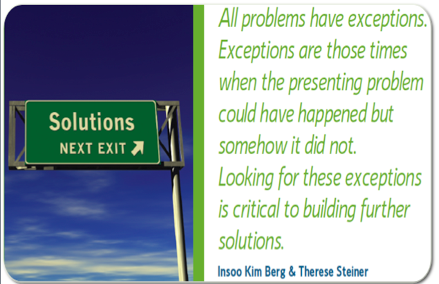 Exception finding – asking when a problem or difficulty happens less or less intensely. This gives information about what skills and strengths the person is able to use at least some of the time, e.g. Is there a time when the behaviour doesn’t occur, or occurs less often? Future focused – is a means of visualising life without the problem and can lead to setting relevant and meaningful goals, e.g. Suppose in your next maths class you're at your very best, what will you be doing differently? How will others know? What will they see, hear, that will be different? Or imagine it is time for you to go home and you are feeling satisfied with your day. What have you been doing during the day?" Scaling – is a way a of ascertaining the person’s perception of him or herself and the problem at present. This helps identify what’s going well and to focus on where the person wants to get to by moving one point on the scale, e.g. On a scale of 0-10 where 10 equals you at your very best, where are you now? What have you done so far to get to there? What else? What would move you one point up the scale? 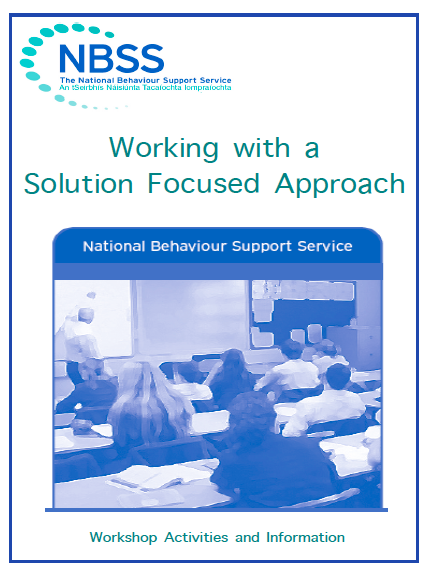 The NBSS supports schools in developing solution focused approaches and using solution focused strategies for positive behaviour improvement at Level 1: school-wide for all students, Level 2: targeted intervention for some students and Level 3: intensive, individualised support for a few students. Additionally, all teachers are provided with a manual to support their practice as well as ongoing support and advice from NBSS team members, who are also trained in solution focused practices. Solution Focused practice emerged from Solution Focused Brief Therapy. It was developed in the mid 1980s primarily by Steve de Shazer, Insoo Kim Berg and the team at the Brief Family Therapy Centre in Milwaukee, USA and later in Britain by members of BRIEF. BRIEF is one of Europe’s largest providers of solution focused training and has facilitated the NBSS training of teachers from partner schools.